Lambuel's Adventures! Lambuel & Friends Kidz Art Draw Lambuel! Dress Up Lambuel! Hey kids! Ask a parent or youth pastor to help you with these fun crafts! Parents & Teachers: Lambuel crafts are a great activity to help keep children busy learning about Jesus. Use them as opportunities for discussing issues and teaching values. Adult supervision required for crafts involving scissors or knives. Our printables are in high-quality PDF format and require the free Adobe Reader to view and print. Your kids can learn the 7 easy steps to draw Lambuel's head while also learning some fun Bible facts! Print them out and have your kids color them in! 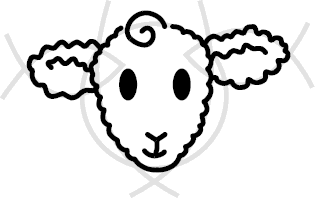 Lambuel Coloring Tracts will teach children reading skills and Bible skills, all while imparting the valuable moral lesson that we should not color outside of God's lines. More Coloring Tracts coming soon! LOL means Love Our Lord! Now you can color Him too! Laughing Jesus printouts are fun to color and even more fun to post around your neighborhood! Brighten everyone's day with Laughing Jesus! 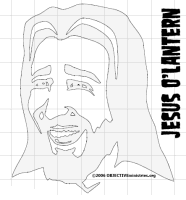 Make a Jesus O'Lantern! This super fun family activity will help you witness to the unsaved on Halloween. All you need is a pumpkin or other large gourd, some carving tools, a candle, and our own Jesus O'Lantern Pattern (instructions included). When you're done, send us a testimonial about all the unsaved children your Jesus O'Lantern shined the Light of our Lord upon, along with a picture for our Pumpkin Patch! With this easy-to-make Lambuel mask, your child can dress up like Lambuel and know that Jesus loves him or her too. Combine it with a green turtle neck sweater for extra Lambuel fun! Requires: 1 sheet of paper or card stock, scissors, tape, and a length of string. Cut out this Witness 'Stache for your child to put in their nose... they'll look just like a youth rock minister! When their unsaved friends see it and ask about Jesus, your child will get valuable witnessing experience telling about how great He is! Requires: 1 sheet of paper or card stock, scissors, and a nose. Our paper models were designed for us by Mr. Yozo Kutsushima of Tokyo, who uses traditional Japanese paper crafts to teach Christian values to the people of Asia through his Happy Origami Ministry. The models can be printed on both US Letter and A4 sized paper; when printing in Adobe Reader, set "Page Scaling" to "None" and check "Auto-Rotate and Center". Make your own adorable Lambuel action figure for super fun Lambuel adventures! Lambuel has raisable arms and a rotating head for super fun Lambuel looking-around action! Requires: 1 sheet of paper or card stock, scissors, hobby knife*, scoring tool, glue. Coming soon: more Lambuel playsets and vehicles! Fun Lambuel Adventure: Lambuel loves to travel so he can share the Good News with the world! Bring Lambuel with you on your vacation or other trips and take pictures of him at all sorts of neat locations. Be sure to send them to us so we can see where Lambuel's been. Make your own Ruby the lioness. Ruby loves her cute dress and bow, but most of all she loves Jesus and Lambuel! Girls can play house with her while waiting for Lambuel to come home from his adventures. Coming soon: Kitchen and Wedding Day playsets! Coming soon: Disheveled Front Yard playset and Darbucks Coffee Den of Iniquity playset! Make your own Habu the confused polytheist action figure. Habu has so many false gods that even he can't remember them all! He would dearly love to simplifiy his life with Jesus, but he lives too far away to hear the Good News. Help Lambuel go on a mission to save Habu! Coming soon: Island of Polythesia playset with hut, various shatterable idols, and missionary gear for Lambuel! Jesus has just risen and He's ready for adventures in Faith! Behold His nail holes (John 20:27)! Whether helping your children save Mr. Gruff or just hanging out on the dashboard of your car, this Jesus action figure will bring hours of enjoyment and Faith-based fun! Coming soon: Doubting Thomas figure with finger-poking action and Galilee playset! 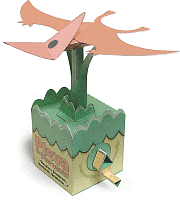 Turn the crank and watch Pteva the Pterodactyl flap his wings as he flies off in search of his brethren so that they may be witnesses for Creation! Pteva is the official mascot of Project Pterosaur. Intermediate Project: Suggested for ages 10 and up. Requires: 2 sheets of card stock, glue, scissors, hobby knife*, ruler, and scoring tool. Turn the crank and watch Professor Giraffenstein nod and move his arm. With every turn, one of six informative Creation Science fun facts will be displayed. This paper automata teaches mechanics, irreducible complexity, and scissor skills. Advanced Project: Suggested for ages 12 and up. Requires: 3 sheets of card stock, glue, scissors, hobby knife*, ruler, and scoring tool. Make a nail just like the ones used by the Romans to crucify Our Lord. A thought-provoking project that will impress upon your children the suffering that Jesus went through on their behalf. Makes a great Christmas ornament! Caution: Pointy edges. Not for children under 5. Requires: 1 sheet of paper or card stock, scissors, scoring tool, glue or tape.